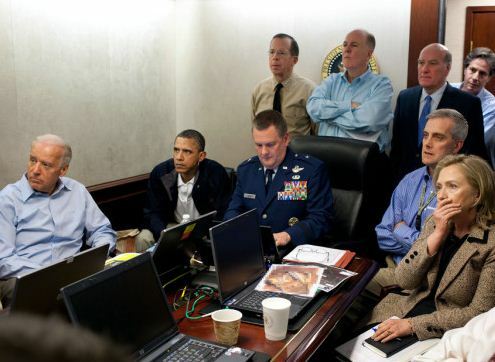 *The first presidential approval poll since the killing of Osama bin Laden has just been released and shows a considerable bounce in the number of Americans giving him high marks on dealing with terrorism and the situation in Afghanistan. 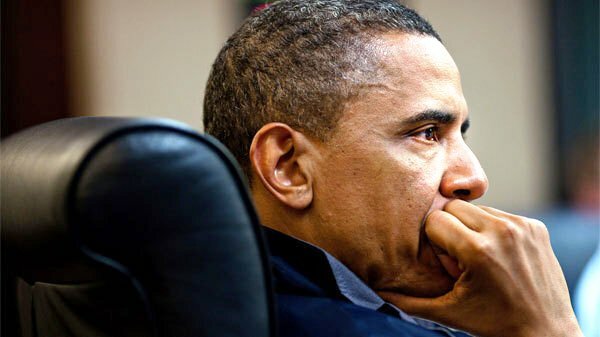 But the new poll, conducted Monday evening by The Washington Post and the Pew Research Center, also finds virtually no movement in Obama’s numbers when it comes to handling the economy. That suggests that success on one front — even one as important as the death of the mastermind of the Sept. 11, 2001, attacks — might not translate easily to other areas, reports the Post. The Post-Pew poll was conducted by conventional landline and cellular telephone Monday evening, and included interviews with 654 randomly selected adults. The margin of sampling error is plus or minus 4.5 percentage points. Overall, 56 percent of those polled say they approve of the way Obama is handling his job as president, an increase of nine percentage points over April polls by Post-ABC News and Pew. That is the highest approval rating for the president in either poll since 2009. There’s also been a clear increase in public satisfaction with the way things are going in the United States, although by a margin of nearly 2-1, Americans are still dissatisfied with the direction of the country. The president gets big bounces on dealing with Afghanistan, with his approval rating soaring to 60 percent, and on handling the threat of terrorism, where he recorded a career high of 69 percent. More than three-quarters of all Americans say the president deserves credit for the killing of the bin Laden in Pakistan on Sunday. Among Republicans, 61 percent say Obama deserves at least some credit for the move. But just 17 percent of them say he deserves a “great deal” of credit for bringing bin Laden to justice after a nearly 10-year pursuit by U.S. intelligence and military forces. Republicans are more apt to give former president George W. Bush acclaim for killing bin Laden, with 81 percent saying he deserves at least some of the credit for what happened Sunday. Only 35 percent of Democrats share that view, however, with a slender 4 percent giving the former president a lot of credit. There is more bipartisan agreement that the U.S. military and intelligence deserve a great deal of credit for the killing. For the president, the nine-point increase in his overall approval rating is on par with the six-point increase in Bush’s numbers in the weeks following the capture of Saddam Hussein in Iraq in December 2003. Then, as now, political independents moved the most. Compared with the mid-April Post-ABC poll, Obama’s approval rating among independents is now 10 points higher, at 52 percent. Bush got an identical 10-point boost among independents in December 2003. For Bush, that lift proved short-lived, with the entire increase gone within six weeks.